FatCow was established in 1998, providing hosting services for small and medium-sized businesses, owned and managed by Endurance International Group (EIG); EIG owns other well-known web hosting providers, such as, BlueHost, HostGator, iPage, and many more. FatCow offer four different web hosting plans, all ranging in price and offering different features. The Original Fat Cow plan is the company’s name for shared hosting, starting at £2.50 per month for the initial term, then increasing to £8.95 per month, which is a fairly steep increase in price. This plan offers unlimited disk space, email addresses, and bandwidth, and includes search engine marketing. The plan also gets your website off to a kicking start with a free domain name and website builder for you to get your name out there, with little effort. A feature of this plan that we particularly like is the parked domains feature. This means that you can purchase other domain names that are similar, or could be commonly used when trying to find your website, and allows you to use these domains to redirect to your actual website. You essentially reserve these domain names for your own use. If you’re unhappy with any of the features that come with the Original Fat Cow plan, they do offer a 30-day money-back guarantee to give you some peace of mind. This isn’t as long as some other web hosting providers, but isn’t something we’d stick our noses up at either. The WordPress hosting plan comes with two options; WP Starter and WP Essential, both offering slightly different features. The WordPress hosting plan comes with a great selection of themes meaning you can get started on your blog or website straight away. If you’re a beginner to WordPress, or you don’t fancy creating your website from scratch, the themes are a brilliant place to start to build your clean and professional looking website. Following on from this, FatCow offers pre-installed plugins, such as, W3 Total Cache, so even if you’re not that clued up in the technology of WordPress, FatCow have got it covered for you. Their control panel is customised to suit their users, making it easy to use, familiar, and essentially simple to understand and navigate. Similar to the Original Fat Cow plan, their WordPress hosting comes with unlimited disk space, bandwidth, and emails, as well as 1 free domain, 24/7 support, free search engine marketing credits, and a money-back guarantee. The plan is essentially the same as the Original Fat Cow plan, but is built for WordPress hosting, as the name suggests, providing an easy to use service. FatCow’s uptime record was of particular interest to us so we had a look at the uptime record over a period of 24 hours, 7 days, and 30 days. We are very impressed with these results to say the least! We also checked out Uptrends results to see how quickly the website responded; the average response time was around 1.2s with a maximum of 3.6s; not the best we’ve seen, but not the worst, and if you’re getting 100% uptime, an extra second or two is worth the hit. FatCow’s uptime record across the space of several years has shown an average uptime of 99.85% – 99.9%, and sometimes better, which is really pleasing to see. If you need any further guarantees, FatCow hosting plans all come with daily backups, so if anything does go wrong, you’ll be covered. They may be a little less well-known in the web hosting market compared to other providers, but FatCow certainly don’t scrimp when it comes to the tools and features that they offer. Marketing: If you’re wanting your website to be seen, and intend to do some marketing for it, FatCow offers credits towards Google AdWords, Yahoo!/Bing, Facebook, and even a listing in the Yellowpages. Most other companies offer one or the other, but FatCow hand it all to you on a plate, at least getting your marketing off to a good start. eCommerce: More and more users are now building their own online stores, and the web hosting market has to keep up in order to meet their customers needs. FatCow gives you a free online store, which you can create and customise to your heart’s content. This also includes a choice of shopping cart, PayPal integration, and a shared SSL certificate, so all bases are covered. FatCow are most certainly up there in the top rankings when it comes to usability. If you’re a beginner, you’re going to find FatCow offers a slick user experience that’s very intuitive. From basic tools to get your website up and running, website builders, and eCommerce assistance, we don’t think you’ll be disappointed. 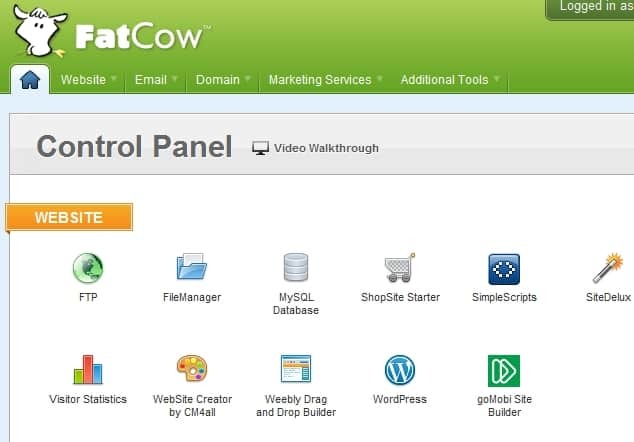 FatCow’s 1-click installs are similar to other web hosts, a now staple part of any great web host, allowing you to install the likes of Magento, Drupla, and WordPress at the click of a button. Admittedly, FatCow’s interface isn’t the most attractive we’ve seen, but it does provide a good user experience, and offers all the tools and features required to get a great website running. We’d like to see some improvement on the design front, but it wouldn’t put us off using FatCow – after all, it’s your website that needs to look great, not theirs! It might seem strange to focus on FatCow’s money-back guarantee as a talking point, but as they don’t offer an uptime guarantee, we felt it prevalent to go into their refund policy in further detail. If you’re not happy with FatCow’s services, or simply no longer require them, you’ll need to let the provider know in writing. Their 30 day money-back guarantee means you’ll get a full refund within the first 30 days of your web hosting plan, however, it’s worth noting that this refund does not cover domain registration or any extra services or addons you’ve purchased. If you want to keep your domain name, FatCow allows you to, and will simply deduct the cost from your refund. We actually think this is a great feature, and something that other web hosts may not provide. FatCow’s support team can be contacted 24/7 via telephone, email, and live chat. All contact methods are free which is refreshing to see as some companies charge through the roof when it comes to actually contacting someone. We contacted FatCow via live chat initially and were presented with a message that all available chat advisors were busy but would be with us shortly; a little frustrating, but within the space of 5 minutes, we were greeted with a friendly member of staff who apologised for the waiting time. The advisor was knowledgeable, technically savvy, and answered all of the questions we had. FatCow’s website also has a knowledgebase which is very in-depth; we searched for the answer to a simple question which was ‘email client setup’ and were really quite overwhelmed with how much information there was available. The guides list every email client we could think of, mobile devices, and gives you a full detailed walkthrough of the different settings, what they mean, and how to resolve any issues you might have. If the knowledgebase isn’t helpful, which we can’t see how it wouldn’t be, all of FatCow’s contact details are there on the same page; they’re not hidden like some other companies, and almost encourage people to get in contact if they need any assistance which is, once again, very refreshing to see. Like much that FatCow do, their customer service is average at best. Typical live chat and phone support response times range between 5 – 10 minutes, with most issues resolved between 5 – minutes also. FatCow has come a long way since its birth in 1998. The plans that FatCow offer really tie in to the aim that they want your business to grow; the more features, speed, and security that your website requires, FatCow are on hand to provide you with the next step up in your hosting plan. This web host offers competitive pricing with easy to understand plans; with dedicated servers and VPS hosting, you’re also reassured that if you want to expand your website, or your business starts to grow, it’s easy for you to upgrade and stick with the same hosting provider. FatCow are continuing to grow themselves, and this is evident from the new pricing plans and packages that are appearing. With shared hosting, WordPress hosting, and more, we’re sure that you’ll be able to find the right package to suit you, whether you’re a small-time blogger, or big-time business. FatCow don’t give any guarantees about uptime, unlike other hosting providers, which is a real shame; in reality, this isn’t necessarily a big problem as their records show their uptime is extremely good and reliable, but it’s always nice for customers to receive a guarantee. That said, if you don’t like their services, FatCow will give you a full refund within the first 30 days.